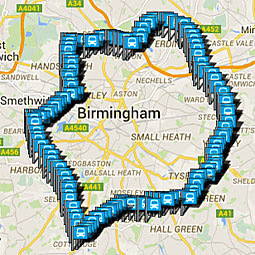 For the ultimate in bus journeys, Birmingham's number 11 is hard to beat. It's Europe's longest urban bus route, or at least it was until a couple of years ago when Coventry nipped in with a spoiler three miles longer, but I'm so not going there. 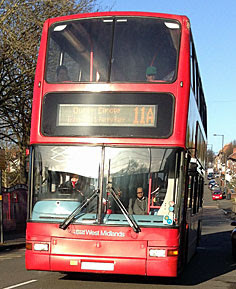 The number 11 has been running around Birmingham since 1926, introduced to add orbital connections to a mostly radial network. It follows the Outer Circle, now the A4040, a peripheral ring road comprising various arterial streets bolted together a few miles outside the city centre. As such it tours the less famous parts of Birmingham, including such faceless suburbs as Harborne and Hall Green, and is therefore perfect for understanding how Britain's second city really fits together. A few facts before we start. There are two number 11 buses - the 11A which runs anti-clockwise and the 11C which runs clockwise (if you're wondering why there isn't an 11B, look again at the initial letters of those directions). That's unless the bus isn't going all the way round, in which case it's numbered 11E and displays 'Short journey' on the front, if you can describe anything about this journey as short. Double deckers run every ten minutes during the day, and a ticket for as far as you like costs only £2.20. In total the route serves 266 stops along 27 miles of road, and a complete journey (in good traffic) takes somewhere between two and three hours. You'd have to be a bit mad to ride the whole lot back to where you started, but many have risen to the challenge, and I now count myself as one of them. You can start your orbit anywhere but I started in Winson Green, to the west of town, This is the point where Birmingham's tram system, the Metro, interchanges with the Outer Circle, and also pretty much the closest the bus comes to the city centre. Down the hill it came, the anti-clockwise bus with its electronic scrolling destination, rattling through places I'd not be visiting for nearly three hours hence. Both top front vantage points were taken so I settled in further back, perhaps not quite as comfortably as on a London bus, and wondered what sights my journey would bring. Within a few minutes it had brought a railway, a couple of canals and a Her Majesty's Prison, so pretty much typical of Birmingham except for the penal establishment, of which Winson Green would be the sole example. The slowness of the upcoming journey was soon becoming apparent. The route is built-up almost every step of the way, and deliberately ticks off several neighbourhood centres, such as the heart of Bearwood (where we got stuck behind cars trying to enter the local Lidl). Most passengers are making shortish hops of a mile or three, so there was invariably someone at each stop wanting to pile on or disembark, or both. They weren't badly behaved either, at least on this bus at this time (which was early afternoon) on a non school day. This turnover soon created an opportunity to grab the front seat, swiftly taken, only to be joined at the next stop by an elderly Midlands soul who attempted to strike up an empty conversation about the weather, and failed. Typical Birmingham architecture turns out to be very much Victorian, at least out around the Outer Circle, so we pass umpteen brick terraces, several brick churches and quite a few place-making pubs. Indeed the thing that most struck this Londoner was the relentless emphasis on houses rather than flats around the entire suburban ring, as you might expect when an area's housing stock dates from nearer 1900 than 2000. But there were a few much more modern intrusions along the way, like the ugly concrete slab blocks in South Yardley, and also a fine panorama of the city's glass core three miles distant from an elevated roundabout above Selly Oak. And then there was Bournville. You may know it as a dark chocolate, but it's also the garden village where George and Richard Cadbury built their chocolate factory, which I wanted to get off to see. The 11A stops on the village green beside the birdhouse-like Rest House, a lovely spot leading down to a parade of Tudorbethan shops featuring butcher, baker and high quality florist. Close by is the Quaker meeting house the brothers inaugurated, and some actual Tudor houses shipped in from Selly Oak to add half-timbered authenticity. Behind the shops is Cadbury World, the light mauve tourist attraction, and the cricket pavilion by the river is so turrety as to look Wonka-esque. That's all I gathered from my ten minute walkabout, but very nice, Birmingham, very nice. The next 11A proved much less appealing. One of the top front seats was taken by an obese man laid back and snoring, occasionally waking with a splutter and attempting not to topple over. The other seat looked free but no, there was a box of half eaten chicken and chips on the moquette and a can of Red Stripe jammed between the backrests. So I sat further back, again, and tried to concentrate on Cotteridge and Kings Heath rather than the nostrils flaring close by. Then things suddenly took a turn for the worse, as the fat man reached for a packet of cigarettes, removed one and lit it, then proceeded to puff away for the next five minutes. I'd forgotten how much buses' upper decks used to smell of smoke, and this forced reminder didn't prove pleasant. Thankfully I was hopping off again shortly afterwards to see the 11A's other major tourist attraction - Sarehole Mill. This Georgian building was an inspiration for JRR Tolkien, who lived very close by as a child, and wove it into Lord Of The Rings as the watermill in Hobbiton. Had it been the summer months I could have gone inside, or explored The Shire Country Park nextdoor (more municipal than magical, from the scrap I saw). But instead I still had more than half of the circuit to complete before dusk, so needed to board the very next 11A down the hill. Result, this bus was virtually empty, and smoke-free, and a much more civilised way to proceed. I found the eastern side of Birmingham less interesting than the west, which may have been an accurate reflection of the area or may have been travel fatigue setting in after the first hour and a quarter. Unfortunately our driver appeared to be in no hurry to get round, pulling over at various stops merely to slow the service down. I saw too much of Fox Hollies Road, and lingered too long in Acocks Green (although this may have been because its bus garage is the circle's official starting point, so perhaps the driver was changing over). We slipped slowly over the Grand Union Canal, and then in Yardley spotted the previous 11A immediately ahead so slowed down yet again rather than risk catching up. Each bus stop on the 11A/11C shows the name of the next suburb along the way, so its possible to measure progress by seeing when Stechford changes to Erdington changes to Perry Barr. Alternatively one can tick off the pubs, proud behemoths like the Fox and Goose once the heart of communal drinking, now 'two meals for £10' and an 80s disco at the weekend. I knew we were making decent progress when we passed beneath the M6, alas a mile to the east of Spaghetti Junction, but still striding down the Tame valley on concrete pillars. In Erdington the top deck started to fill at last, although when I turned round this was merely a young baseball-capped couple making enough noise for a dozen and, sheesh, lighting up yet another cigarette. You never would in London, but in Birmingham it seems they often do. Marsh Hill marks the 11A's most northerly point before descending to cross the M6 again and enter Aston Villa territory. We turned off just before the stadium, past the university and our umpteenth Tesco, but signs on lampposts still displayed the date of the next FA Cup-related parking restriction. And then we stopped in Perry Barr, mysteriously for ten minutes, which gave me ample time to decide that this was the most unpleasant place on the entire circuit. The local pub, the Crown and Cushion, was now a cheap takeaway with a gang of lairy bikeriders stood outside, while the shopping parade was a budget affair frequented by the hoodied - nothing much worse than you might see in London, but distinctly out of kilter with the remainder of my journey. And finally, rounding the northwestern corner of the Outer Circle, my 11A reached Handsworth. Its reputation outside the West Midlands rests on a series of inner city riots, whereas the reality appeared to be a busy multi-racial neighbourhood superimposed on a Victorian suburb, more of a Wembley or Southall than a Brixton. We traced a run of Asian and European shops down Rookery Road, filtered across the main street and then, offering up thanks, I recognised the next descent as the road where I had started. Alighting I noted that I was the only white face on the bus, or had been, and tripped back up to the tram stop, circuit complete. And whilst I can't recommend that you do the same, not unless you're in the area and have three hours to spare, I'm pleased that I found the time. Though Birmingham's our second city, to most of us it's a blur - a concrete-hearted conurbation with a sterotypical accent. But I now know it as a vast and very human place, where suburbs mix with waterways, parkland and the occasional mill tower, and I feel a whole lot better informed as a result.